This class is structured for children of no specific age who are capable of swimming 8-10 feet and can roll over to their back and rest comfortably, and are then capable of rolling back over and swimming to the side of the pool or to a teacher. Students at this level will learn the basics of Bubbles and Roll [which is our name for Free Style or the Crawl], and the Back Stroke. 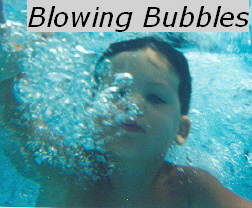 Students will learn to blow long, slow, true, honest bubbles, and learn to roll their head to breathe, hence Bubbles and Roll!!! Teaching students to blow long bubbles is very painstaking work for both the teacher and the student, but this is basic and extremely important. Parents please be patient with your student and with the teaching of this skill. This is a class that students will stay in the longest, please be very patient, I cannot stress this enough. If the students do not get the skills at this level we cannot move them to the next class level.